Own A Luxury Lifestyle Inspired by Central Park. Gurgaon is an incredible city and a popular part of the National Capital Region that goes through constant development every single day. This city has a lot to offer its inhabitants and does not settle for less. The real estate market in Gurgaon has risen over the years with a number of residential and commercial projects throughout the city and has a lot to offer today. Central Park Cerise Suites Floors is a new residential project in Gurgaon by Central Park that offers a lifestyle of pure luxury and divinity. Extended over luscious acres of land, this development contains outstanding towers that offer 2BHK + Study floors of different configurations that are crafted to perfection. The apartment area sizes start from 1210 sq. ft. and go up to 1660 sq. ft., providing beautiful luxury space that you will never run short of. Central Park Cerise Floors Gurgaon is a premium development that offers a total package of luxury, comfort and style through its range of internal and external amenities. The apartments are spacious, provide ample sunlight, cross-ventilation and contain high-end furnishings and fittings, high-quality flooring, modular kitchens, tough doors and beautiful windows providing landscape views, high-quality electrical sockets located perfectly of convenient access, safety features and a lot more. This development contains a range of external amenities that are high on luxury and simply spectacular. They include a clubhouse, meditation centre, gymnasium, multiple sports facilities and a play-area for your kids, day care centre, multipurpose hall, café, golf course, 24hour water supply, gorgeous landscape garden, open space, 24hour water supply, efficient power back-up, swift elevators, well-trained security and the list just goes on. Located at Sohna in Gurgaon, Cerise Floors comes in close proximity to a number of places like schools, colleges, medical centres, hospitals, supermarkets, general stores, malls, shopping centres, cafes, restaurants, cinemas, showrooms, banks, ATMs, expressways, public transport and more. Experience total convenience that will always keep you relaxed and at ease each day. Starting at a price of Rs.80.87 lakhs, it is an undeniable fact that the Cerise Suites Floors price is affordable and simply irresistible. Make way for a new world of luxury and comfort that will be loved and appreciated by you and every member of your family. You can choose from a number of payment plans and also opt for easy home loans at decent interest rates, NRI services and a lot more for a convenient purchase. 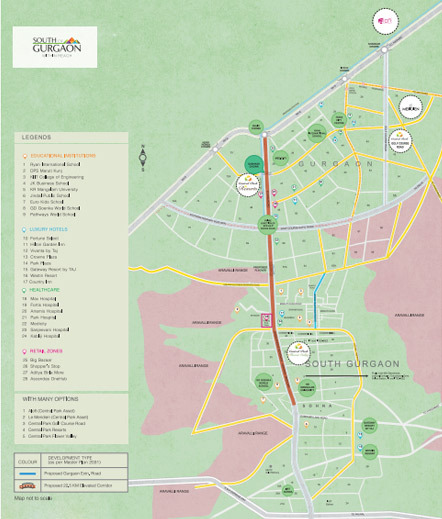 Extension of the metro from Huda city Centre already planned for Sohna Road. Fresher and cleaner living environment at the foothills of Aravallis.